First off, thanks so much to the fab Cozy Chicks for having me! I love all of your books, so I’m honored to be hanging with you today. Secondly, this is the first day of my two week Hollywood Confessions Blog Tour, so please check out my website for more tour stops, as I’ll be giving away cool prizes (including gift cards, free books, cameo appearances, and Hollywood Headlines swag) at each stop! As I mentioned, I’m a big fan of the mysteries written by the lovely ladies on this blog, as well as cozy mysteries in general. While I do enjoy a police procedural or a legal thriller from time to time, the idea of an average person getting thrown into the middle of a murder investigation is the type of story that really floats my boat. Maybe it’s the idea that this sort of wild adventure could actually happen to someone like me. (I’ll admit, the summer when I was ten, I prayed daily that I would find a mysterious stranger, a la Nancy Drew, to investigate.) Or maybe it’s the amateur element that makes it more interesting - someone getting to the truth of the matter without the aid of DNA or forensics. Whatever it is, as a reader, I heart cozy series. As a writer, they present one unique challenge… how to make it believable that this amateur, every-woman continually stumbles on dead bodies. As much as I prayed for a Nancy Drew-esque encounter, I’ve never personally stumbled on a dead body. Honestly I’ve never even seen a dead body outside of a funeral home. And while I might suspend my belief for a moment that an average person could possibly just be in the wrong place at the wrong time once, it’s pretty hard to imagine them being unlucky enough to do that six, seven, or eight different times as a series goes on. So, the first challenge I always encounter when starting a new mystery series is how to hold onto the amateur element I love so much while still making it plausible that this character is so very unlucky in death. In the first mystery series I ever wrote, the High Heels Mysteries, I’ll admit I went with the “unlucky” theory for book #1. But to sustain the multiple dead bodies that kept coming into my main character’s life, I gave her an on-again,off-again boyfriend in the L.A.P.D. who acted as her window into a lot of the cases she investigated in future books. Granted, she was still a bit more unlucky than your average person, but hopefully not too unbelievably so. For my second mystery series, the Hollywood Headlines Mysteries, I thought long and hard about how to create built-in bodies. After rejecting a of couple early ideas, I decided to go with newspaper reporters. And, just to make things fun, I put a twist on the job, making the heroine of each book in the series a reporter at a Hollywood tabloid, building in not only access to deadly stories, but scandals, sensation, and juicy gossip as well. The first book in the series, Hollywood Scandals, follows Tina Bender, the gossip columnist at the infamous L.A. Informer tabloid as she receives a threat from one of her stars that reads, “If you don’t stop writing about me, you’re dead.” In book #2, Hollywood Secrets, Cameron Dakota, the Informer’s staff photographer and paparazzo extraordinaire is witness to a movie star kidnapping. And in my latest release, Hollywood Confessions, the Informer’s newest reporter, Allie Quick, investigates the death of reality TV show producer whose concept of the word “reality” is a little on the creative side. Hopefully with each of these I’ve blended the element of the “unlucky” amateur with just enough believability to create a plausible, fun adventure that every woman can still relate to. Since my brand spankin’ new release, Hollywood Confessions, is the 3rd book in the series, today I’m giving away an Amazon.com or BN.com gift card (winner’s choice) worth $15 so that one lucky winner can either download the first two books in the series (priced at $.99 and $3.99), or purchase the first book in print (priced at $12.99). All you have to do to enter is post a comment below about one of YOUR favorite cozy mysteries. I’ll pick a winner at the end of the day and post her/his name at the end of the comments! 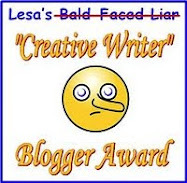 Hi Gemma, thank you for your blog. I haven't read your books yet, but someday I certainly will. I have never read a cozy series whit multiple heroines. It's always the same cast of characters (which I love). But you did intrigue me, so I will certainly check it out (even if I don't win). Are you using the names of real celebrities in your books? Earlene Fowler's Benni Harper mysteries are at the top of my favorites list. I just love the characters and always feel welcomed back into their lives when I open one of her books. Best of luck with Hollywood Confessions. It sounds wonderful. Gemma, I so enjoy the High Heels series, will you write another since Maddie and Rameriz are now married? Sure hope so. Hi Gemma! Your Hollywood Headlines series sounds great. I'll put it on my TBR list. One of my favorite cozy mysteries is the Flower Shop mysteries by Kate Collins. I also love the Goldy Schulz culinary mysteries by Diane Mott Davidson. The idea of an ordinary person stumbling upon dead bodies is quite a problem in fiction. I've never found one either. It's sort of a Cabot Cove syndrome; how can so many people die mysteriously in such a small town? Your ideas to solve it are very creative. Aurian - Yes, I do name drop real celebs. Carefully. I've had legal censor me at times to watch what I say about real poeple. So, when I want to say something *really* bad, I make up a fake one. Cozies are my favorite! I, too, really like Lucy Valentine - her job as an on-call psychic for the police department makes her involvement with dead bodies much more likely. I love to read cozy mysteries. They take me out of my normal element for a little while and let me try to be a detective in my own mind! 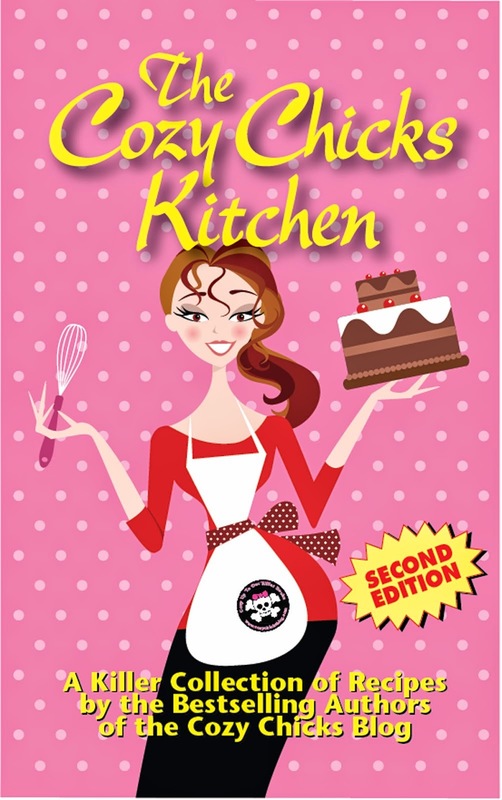 Kate Collins is what started me on the cozychicks and I continue all of her's and many of the other authors. I also really like JoAnn Fluke and Laura Levine. I forgot to name my favourite cozy series. I'll have to pick Laura Childs and her Teashop mysteries. I love the setting and the characters and all the tea lore as well. There's no way I can pick a favorite! Too many to choose from. Your Hollywood series sounds great, Gemma--can't wait to start reading it! Gemma, I have not read your books yet but they will be added to my TBR list. As for favorite character, let's see maybe it is Kelly by Maggie Sefton. But them again I can't really say ther are so many that I love. 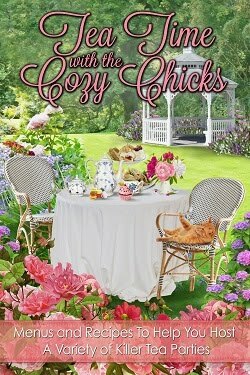 I love cozies and my latest favorite series - but not my only - is Julie Hyzy's White House Chef Mysteries. Kate and Maggie's series were the ones that first got me interested in cozies. Your books sound interesting, Gemma. I'm going to put them on my list to look for. My favorite cozy series has to be whatever one I'm reading at the time. Today it's the quilt mysteries by Earlene Fowler, but I also read everything by Kate Collins, Lorraine Bartlett (under all her names), Maggie Sefton, Jenn McKinley, Rhys Bowen, Deb Baker (aka Hannah Reed), Heather Webber, JB Stanley, Leann Sweeney ... Well, you get the idea, I could go on and on. Hard to choose just one cozy series. If I am to choose, I would have to say Denise Swanson's Scumble River books with Skye Denison, the school counselor, as my favorite. Good luck with your new series. Always like to see a new series coming along. Hi Gemma I will have to get your book to add to my collection, they sound good. I am a lover of all cozy mysteries but the first series I read will always have a place in my heart and it one of my favorite. It is the scrapbooking mystery series by Laura Childs. I love to scrapbook and read so this was a neat series for me. A new series that I have now fallen in love with is the Lucy Valentine series by Heather Webber - I read all three books in one week. I love that cozies are becoming more popular in the reading world. Ohmigosh, these are all great series. I'm making a list to add to my TBR pile! Looking forward to the Hollywood series. I really love the Booktown series. Also Heather W's earlier Nina Quinn series. A New Maddie book - Yippie! I bought Hollywood Confessions and I'm looking forward to reading about Felix and Allie together. There are so many good series out there it's hard to pick just one. Kate Collin's Flower mysteries, Ellen Byerrum's Crimes of Fashion, Donna Andrew's Meg Laslow series are all fun, wonderful books. Okay, and now for our $15 gift card winner...I'm having my boyfriend pick a poster at random... and it is... Brittney! Brittney, shoot me an email at gemmahalliday at gmail dot com with your contact info, and let me know if you'd prefer an Amazon or BN gift card. P.S. Totally spelled my winner's name wrong (sorry!) so had to delete comment and start over. I think I got it now. Lol!